Penquit Manor is a wonderful Grade II listed Devon manor house, with its spacious rooms and many south facing windows making it beautifully light inside, set in about an acre of land with stables, store rooms and ample parking. Fenella Russell-Smith Sales Manager said: “This really is an exceptional house with a wonderful sense of history to it”. This fabulous listed manor house in the South Hams, an area of outstanding natural beauty, provides a wonderful family home with its spacious living areas, five bedrooms and its setting within an acre of land. The house faces south with masses of natural light spilling in through its many windows along the front façade. These look out over a deep front garden to the extensive parking area beyond where there is a stone mounting block close to the gate into the paddock. The entrance to the house is through an open porch, with seating on either side, leading into a cross hall with the massive farmhouse kitchen to one side and the spacious living room with its wood-burning stove to the other. Beyond the living room lie the dining room, study and useful utility area. Two sets of stairs lead up to the first floor and one of these is a lovely original spiral set curving up the back wall of the house. Although parts of the house date back some 900 years its green credentials are borne out by the eco-friendly biomass pellet boiler providing the heating and hot water. To the rear is a courtyard with stable block with two spacious stables, concrete floors and a slate pitched roof with door through to a tack room and a gate into the back of the paddock which wraps around the eastern side of the house. 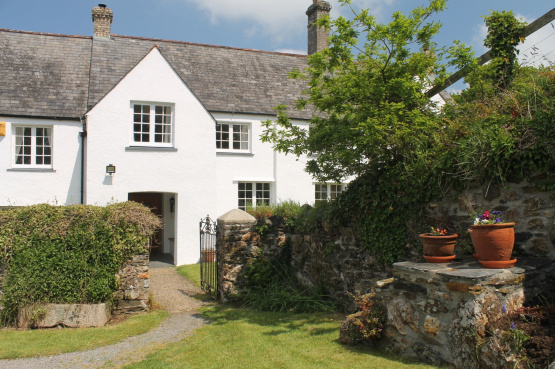 The Prime Waterfront & Country House Department (01548 855590) of Marchand Petit Estate Agents in conjunction with the Modbury office (01548 857588) are marketing Penquit Manor with a guide price of £875,000. Please call for further details and to arrange a viewing.